Lockers have antimicrobial protection to reduce harmful bacteria. Epoxy-polyester powder coated doors and carcass with ventilation to improve circulation. Doors have an all-round reinforcing edge to improve strength and rigidity. Cylinder lock engages with an in-frame locking through the door to provide added security. Locker includes an anti-theft shelf to separate the tiers. Available in a choice of colours, widths and depths with a cylinder lock and 2 keys supplied. Riveted/welded cold rolled mild steel construction. 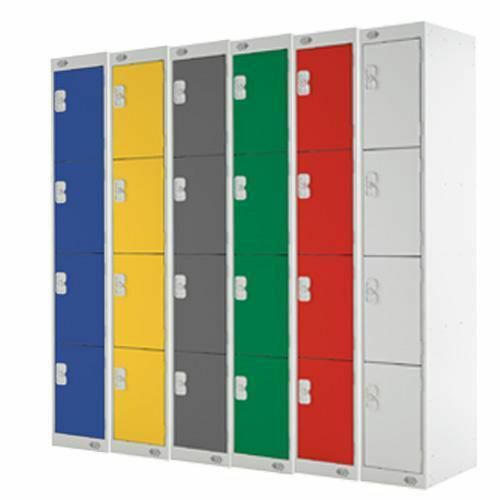 Standard duty lockers have been tested and conform to the requirements of the British Standard for Clothes Lockers BS4680:1996 “Standard Duty”. This product has been finished with ActiveCoat which is a hard wearing, anti-bacterial powder coating for the most stringent hygienic environment with a 99.9% reduction of e-coli and MRSA super bug bacteria. Flat top steel 4 tier lockers that can be used in any environment.